The Bi Luo Chun green tea garden near the village Dong Shan Zhen was the second tea origin place I visited during my 6 day stay in Shanghai in 2014’s spring. The tour was organized by Tracy and her shanghaiandbeyond.com team again. I was told by Tracy beforehand, that it is going to be quite a different experience to the one I had at the LongJing tea green tea garden three days earlier. While in YangMeiLing it was more of a communal experience with several families of the village involved, in Dong Shan there will be just one point of contact for us and this man will be of distinct character. This certainly made me curious. Distance from Shanghai to the tea garden in Suzhou. The Dong Shan Zhen village was located a 90 minutes bus ride West of Shanghai on a peninsula of the Taihu lake, which is among the three biggest lakes of all China. The little village we got to see was wonderfully traditional in its way and did not have anything of the hussle and bussle of Shanghai. Actually the attractive remoteness of the village and its long history make it interesting for a lot of Chinese tourists from big cities to visit, that gives them a chance to take a step back in time and see how peaceful, quiet and authentic China can still be. It was a rural town with many handmade products on sale in the alleys and especially local gastronomic specialties. One of those was a rice wine retailer, who showed us his craft of rice wine making in detail. We were also invited to try out the many sorts of rice wine he had for offer. I am not really much of a fan of those liquor kinda things, but other members of our group were happy to taste it. The available flavors went from peach infused rice wine, over egg infused rice wine all the way up to really special stuff like snake infused rice wine. Each of them were supposed to have some specific medicinal purpose. I remember that the snake rice wine (you could actually see a huge dead snake on the bottom of the rice wine container) was supposed to give men “support in performance”. We also got to talk to a local fisherman, who told us about his daily fishing routines and the development the fishing business of the Dong Shan area. Fishing is still the main income for the people in this area and they are hugely dependent on the fruits of the lake. Obviously life is getting harder for them, as the lake becomes more and more dirty due to the pollution and the missing environmental precautions of the government. After we have gone for a brief tour through the local museum, followed by some exceptionally good local Chinese food at a family in the village (7 courses), we were off to the highlight to the tour, the visit of the tea plantation. Getting there was tricky. The old village was built with several “rings“ serving as protection against intruders back in the old days. The alleys were very narrow and all looked just alike. We really were depending on the guidance of our two tour guides Tracy and Michael to not get lost in this maze. But we all managed to stay together and to get a little bit outside of the village. Here now it was much greener again and we could start seeing the nearby tea plantations. We were led to an old porch of an old mansion. Even though it was a building of significant size, it was a little hidden and you actually had to know of its existence, otherwise you would just pass by. We were then welcomed by the owner of this old house, which also was our host and the owner of the tea plantation we were about to see – the Professor. Our host was a retired Physics professor in his late 40s. As a professor he used to be working in the city, but decided in his mid forties, that he would like to resign from his job, move back to the place where he was brought up and live a life as a tea farmer. This house is several hundreds of years old and looks mystical indeed. Even though its constructed like a stronghold with heavy old stones, the years have not passed by without notice and it needs a fair bit of renovation. But the professor enjoys this sort of work just as his work as a tea farmer and dedicates time to work on his house during tea off-season. You want Zen? The prof’s got it! 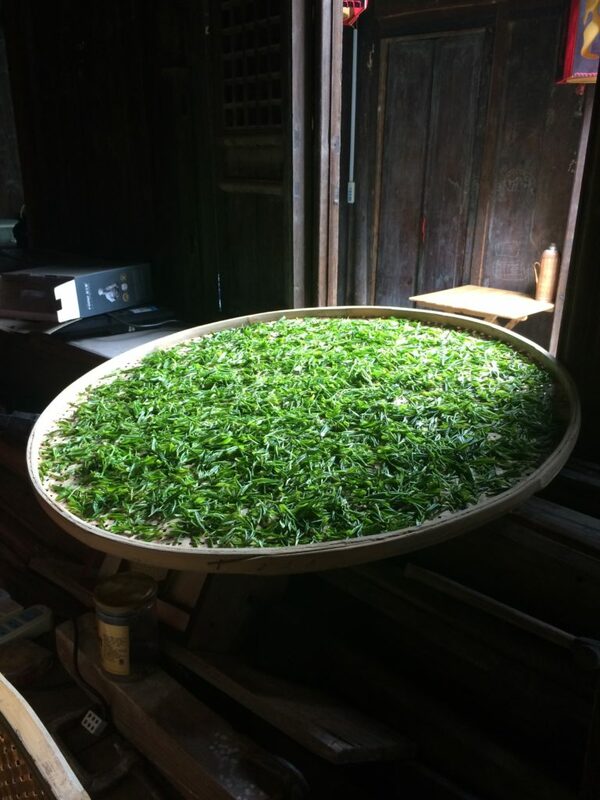 We had the chance to have a look at around his premises and could see big trays of tea drying in the sunlight. 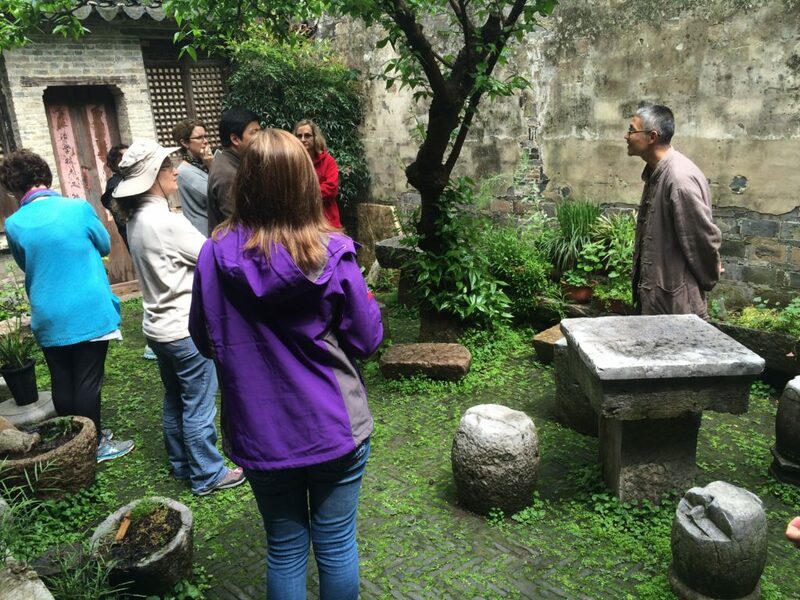 We were shown the inner courtyard of his house and it reminded me more of a Japanese Zen place than an ancient Chinese place. It was the simplicity of the place, that I loved. Those old heavy stones forming the wall of the house, the stones also working as tables and chairs in the icourtyard, the wooden window pains, which were more than 300 years old. A very rustic place, not pretentious at all, as it showed you very directly that there is not a lot of living room couch comfort to be found here, but honesty, silence and time. Lots of time. 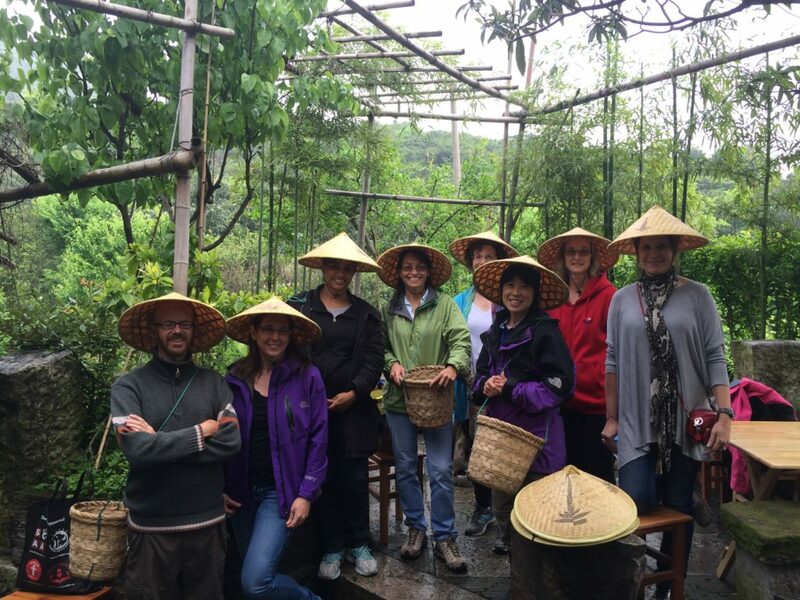 We were able to leave our belongings in his house before we went up to the professor’s plantation and had the chance to dress up as professional tea pickers for a group photo. Group photo of all tea pickers in Suzhou. The plantation was located very closely to the house. We had to climb up a hill until we were standing within his “tea emprire”. On our way up we were passing a buy a decent amount of tombs and family graves. The professor also showed us the tombs of his great grand and grand parents, who were buried between some old tea trees. His family has been living here for many generations. The tea the professor specializes on is called “B iLuo Chun”. Translated to English it means “green snail spring”. This is a green tea and belongs to Chinas most famous green teas. It does not have the popularity the LongJing tea from Hangzhou has, but this region of China we were in, does have a reputation of producing the best “Bi Luo Chun” of whole China. This is mainly due to the long tradition this specific tea has in this area and the old knowledge of B iLuo Chun growing and processing, which gets handed on from generation to generation. Also the great growing conditions of this area in terms of mountains and soil contribute to the great reputation of Bi Luo Chun. 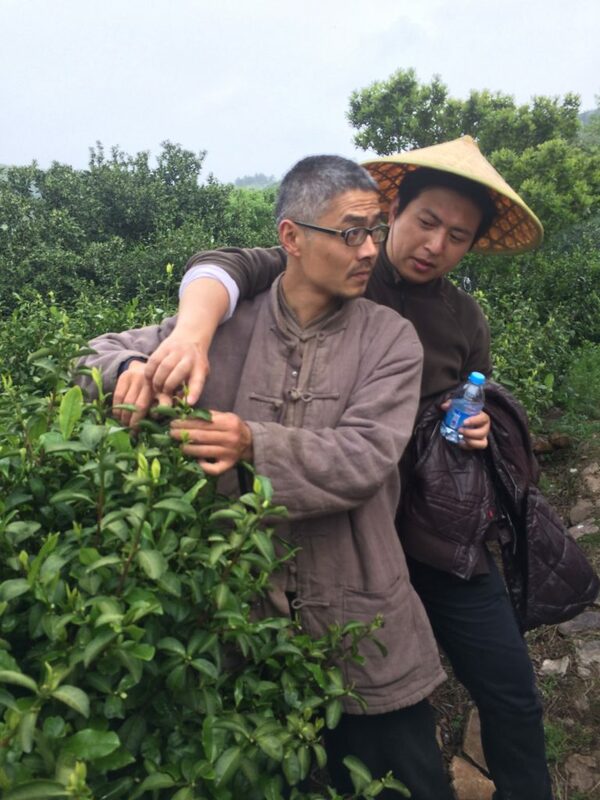 Picking Bi Luo Chun tea leaves. What makes this tea special is the following. While for most green teas you would use three parts of the tea plant, namely the bud and the two leaves that follow, you only use two parts of the leaf for Bi Luo Chun, which are the bud and the first leaf. This makes this tea very precious and exclusive as you actually need to pick more tea leaves for this tea. 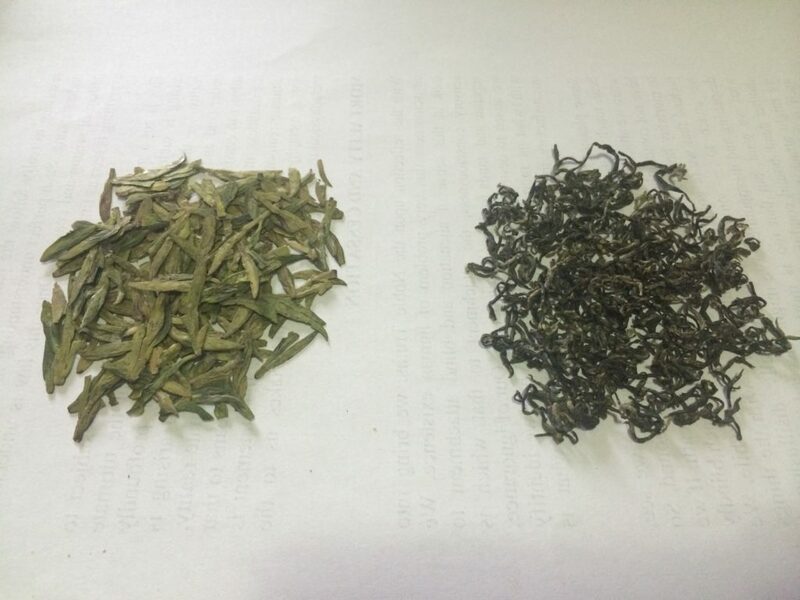 The outcome in terms of leaves of each harvest is consequently lower compared to other green teas, that allow you to use more leaves from the plant. The top parts of the tea plant, the bud and the first leaf, are considered the “freshest” parts of the plant and produce a fresher, more delicate kind of tea. We were to find out about this soon! Back in his house we were shown how to make the actual tea. First step after picking is always withering. The leaves have to rest for several hours in order for them to loose some of their moisture. What follows then is similar to the production as of other green teas – the frying or heating stage. The leaves get thrown into a big heated wok. The professor heats the wok with fire and wood, just like it was done in the old days. His wife was then showing us how to process the tea in the wok. 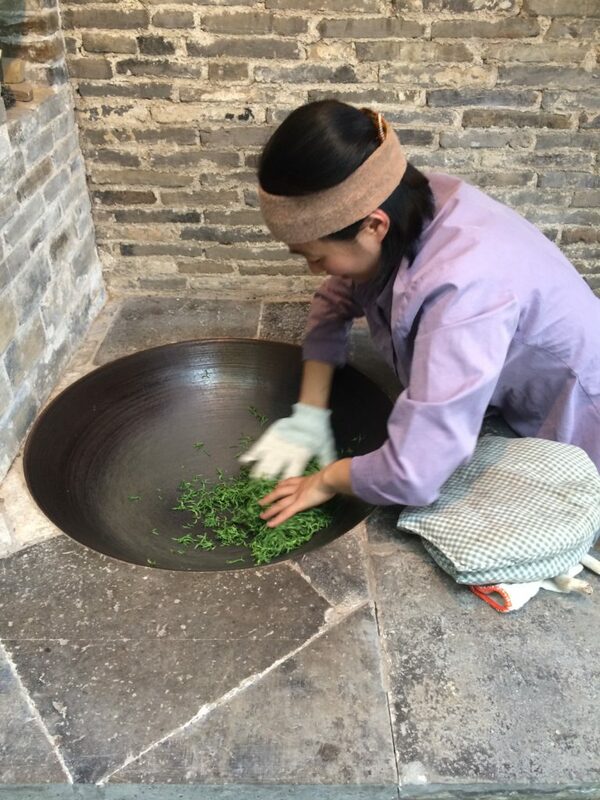 While the beginning was similar to what I have seen for LongJing production, a gentle handling of the leaves on the hot wok surface, in which she glided slowly with her hands through the tea and meshed it up, the handling of the leaves changed after 15 minutes or so. The final tea product looks enterely different to other teas as for example LongJing. Have a look at this picture. While LongJing tea is very flat and needle like shaped, the Bi Luo Chun is curly and feels wiry. What I learned today was that it all comes down to how you move the leaves in the wok. Instead of pressing the leaves down to the ground of the wok, the professor’s wife (I wish could quote her name, but I dont know it unfortunately) shuffled the leaves around in circles. She would lift them up a bit and let then fall through her hands and then give her this distinct whirl around the wok again. Astonishing! And this movement is responsible of giving the leaves it particular look. What also happened was, was the following: Remember how I wrote that only two parts of the tea shoots are being used – the bud and first leave? After a while you could see that the colors of the leaves would change too. The buds would change to white and the leaves part would change to dark green. And this, I was told, is a way of differentiating high quality Bi Luo Chun, from low quality. The more white you can see in the Bi Luo Chun tea you buy, the more buds were used indicating the higher quality. Rolling and roasting the tea leaves of Bi Luo Chun tea. Then we also got to taste the tea off course and while the taste is very distinct and fresh and tasty off course, I found actually the smell of it even more unique in its way. It did not have this nuttiness of LongJing, but more of a sweet, floral aroma – very different indeed and just so extraordinary when you reflect again that all tea comes from the same plant. Yet there are so many differences in taste, even between teas from the same family as green tea for example. In the end we all had a chance to stock up and buy Bi Luo Chun. I was even more happy in the end, when I was offered by the professor to help him next year during harvest season. It would give me the chance to witness the whole tea production process in detail and experience a bit more of this beautiful zen like space in the world.